I am currently on the 6KW tariff but have recently installed an electric cooker. The main fuse is starting to get hot when the cooker and other appliances are on. I realise I probably need to move to a higher kilowatt tarif maybe 9KW. I was under the impression the the system would trip out if I exceeded the 6KW but this does not appear to be happening. What is invloved in increasing the KW do they just change the fuse or will the line to the house need changing as I notice ours is thinner than our neighbour? The traditional main breaker is rather friendly, not trigger happy. In a nutshell : the lower threshold for current limiting is 1.13 * I nominal, and above 1.45 * I nominal your disjoncteur de branchement (DB) is supposed to take immediate action. This explains your observations. But after warming up some time only a small extra current is enough to reach the trigger threshold, there is thermal inertia in the system. Changing from 6 kVA to 9 kVA: the only thing the EDF technician needs is a screwdriver to shift something inside the DB. Wiring: from pole to your house a maximum voltage drop of 2% under full load. Standard wiring sizes in this table to give you an impression. The ERDF should know if your existing wiring is OK for 45 amps (9kVA). 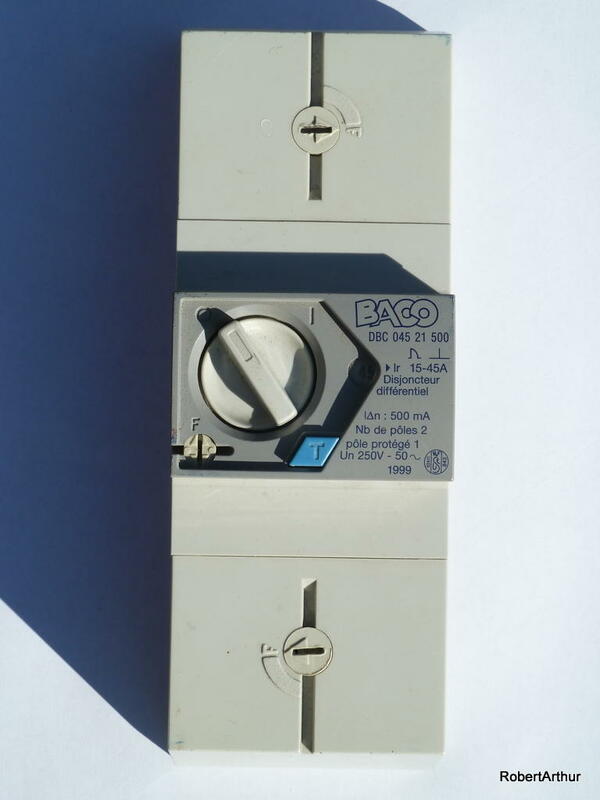 The French single-phase main breakers come in three flavours: maximum currents of 45 A (for 15-30-45 A), max of 60 A (for 30-45-60 A) and max of 90 A (60-75-90 A). You can easily identify them, see DB link above. Supposing that you have the single-phase (monophasé) DB installed of 45 A, the wiring should have been dimensioned for this. It is the maximum possible current of your main breaker that the ERDF takes into account when making the connection from the power grid to the client. So probably your wiring will be OK, but sometimes there is some wiring patchwork dating back to the fifties or sixties of another century and the ERDF will be happy to do something about it when given the chance. this post got me a bit intrigued, i am thinking of doing the same to my semi renovated property, stuck back in the UK at present, the supply cable looks heavy enough but the EDF isolation breaker I can not find. the cable runs from the side of my property up to the pylon and as far as I remember there is no isolation coming from the pylon supply network. what does EDF isolator look like and where abouts would they put it. Although in type 2 the DB is outside, you should also have an additional main breaker (only a simple mechanical one) inside your house. Standard practice for many years in the type 1 wiring arrangement: DB, meter and consumer unit close together. Sometimes separated: first the meter and the DB, and somewhere downstream your tableau électrique. How do they look like: see also earlier (hyper) links, embedded in the text. These French isolation breakers perform three functions: mechanical on/off switch, short and overcharge protection and integrated RCD of 500 mA. Hope this helps. Thanks for the detailed information . I am afraid some of the info is above me!. It is not the DB taht gets hot (set at 30 amps) it is the fuse contained in the Brown bakelite cover next to the meter. From what you have said it sounds like call to EDF and they will visit and change the puissance. Do I pay for this or is the cost covered in the new standing charge? The charge is not contained within your standing charge, it is an extra, in the mid 20's of your euros plus tax (from memory). If you can make a safety issue of the situation, it is probable that ERdF will change your main fuse to one that is more modern and up to date. With a little help from ERDF's latest pricelist I noted that prices are not what they used to be. See F 180 starting at page 21 where they mention their range of interventions for a Modification de formule tarifaire d’acheminement ou de puissance souscrite. Kowalczy's remark about safety is spot on: a fuse should never get (too) hot. The older EDF fuse holders only accomodate fuses up to 30 A. Perhaps the internal contact resistance of the fuseholder is not as low anymore as it once was resulting in overheating, can be dangerous. Time for a change. Thanks for the information I feel confident in the way forward now. Just a quick update on the increase in Kilowattage. Initially contacted EDF in August last year, the work was finally completed in March. It needed approx 6 very long phone calls, a series of emails, 3 home visits from EDF who each time said "Non, pas possible" and eventually I enlisted the help of a very persisent French speaker who after 4 further phone calls managed to arrange another visit. I travelled to France and waited for the alloted day to arrive, at 9.30am I heard the sound of a lorry approaching our hamlet. I was suprised to see a large EDF lorry, cherry picker and 3 EDF employees. They renewed the wire from the pylon to my house, renewed the meter, main fuse box and disjonteur. They tidied up and completed the work in just over an hour. Job done!!!!!! What an acheivement. PS If anyone wants to use the lady who translated and made the final phone calls she was excellent and her prices were reasonable. 1, rue Basse - 85370 Mouzeuil-St-Martin. Sevy, congratulations. It still surprises me how French bureaucracy is able to make simple things difficult. Sometimes they say: your wiring from our grid to your house is too thin: well, what about un câble d'alimentation avec une section plus grande? Your branchement should be underground: yes I know, for new builds, but the so called branchement aérien is still in the ERDF books as an official option, isn't it? Not helpful: the split of the old EDF in the new EDF (production) and the ERDF (powergrid). What used to be a one-stop-shopping affair has changed in coordination procedures between them, feasability studies, subcontractors, a lot of ping-pong paid by the dear clients. Sometimes helpful: the English speaking EDF helpdesk, they are able to provoke a welcome short circuit between those playing out there in the field.